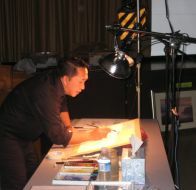 Workshops are taught at my studio in Simi Valley. Studio clean and spacious with ample lighting. A painting will be completed at each workshop. Once a month workshops: 9:00 a.m. - 1:30 p.m. Studio phone number (805) 527-8601.